Protein can have a big impact on your dog's health and happiness. While the amount they need depends on their stage in life — your energetic puppy's needs are different from your constantly cuddly, older dog — the benefits remain the same. Here are just a few of the ways a well-balanced diet with plenty of protein is important to your pup, no matter what age. 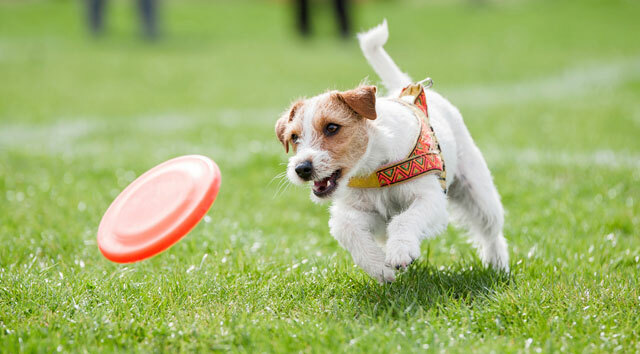 Playtime Boost: Proteins are a natural source of energy for your dog. A well-balanced diet can fuel your dog through a round of fetch or a hiking adventure, even when he's past the puppy phase. That means even more fun bonding time for both of you. As an added bonus, a protein-based diet will enhance the muscle formation and growth that comes from regular play. Fabulous Fur: A well-balanced, protein-based diet can also help your dog's coat — in fact, much of the protein your pup ingests goes directly toward skin and fur health. In addition to supporting new fur growth, protein helps keep the coat shiny and healthy. Healthier skin also minimizes dryness and irritation, which prevents fur loss due to overzealous scratching. Internal Affairs: There are many health benefits to a protein-based diet. It helps develop tissue and boost muscle growth, repairing any damage for your active pup. It has also been shown to improve cardiovascular health and help prevent heart disease. Building Blocks for Better Health: The enzymes and amino acids in protein can promote digestive health and ensure your pup is able to absorb vitamins and minerals from his food. They also help strengthen your dog's immune system and avoid other issues down the line. Healthy Equals Happy: When your dog is healthy inside and out thanks to a well-balanced diet, he will have more energy, less illness, and live a more fulfilling, happy life. Happy dogs make for happy dog owners. The key to feeding your dog a protein diet is to make sure your pooch is getting the right amount. Check ingredients when you shop for dog food and look for choices like ALPO in Gravy — which provides 25 percent more protein than the leading canned competition.